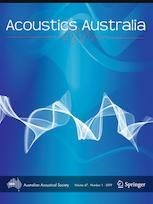 Acoustics Australia, the journal of the Australian Acoustical Society, has been publishing high quality research and technical papers in all areas of acoustics since commencement in 1972. The target audience for the journal includes both researchers and practitioners. It aims to publish papers and technical notes that are relevant to current acoustics and of interest to members of the Society. These include but are not limited to: Architectural and Building Acoustics, Environmental Noise, Underwater Acoustics, Engineering Noise and Vibration Control, Occupational Noise Management, Hearing, Musical Acoustics. The Journal welcomes review papers, covering particular fields of acoustics and addressed to a non-specialist acoustics readership, as well as papers of a “tutorial” nature dealing with important acoustical principles or techniques.